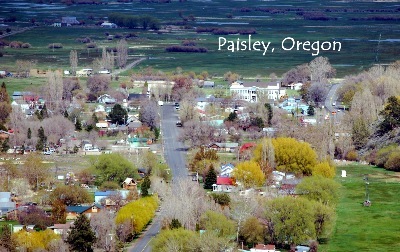 Thank you for visiting the City of Paisley Web Site! We want to give you the opportunity to stay in touch with our City and all upcoming Events . You can reach us at (541) 943-3173 and by fax at (541) 943-3982. We are looking forward to hearing from you. You can also contact us at our e-mail address: info@cityofpaisley.net. If you are not familiar with our City and your first contact with us is online: We would be pleased to hear from you! Please let us know what your needs and questions are, we will be more than happy to help. In brief you should know the following about us: our City was established in 1870 and has been providing City Services since its incorporation in 1911. We are famous for our annual Mosquito Festival which is always the last full weekend in July. Special Thanks to Earl Reed for the photos of and around Paisley.